Discover South Africa's most iconic road trip; The Garden Route. 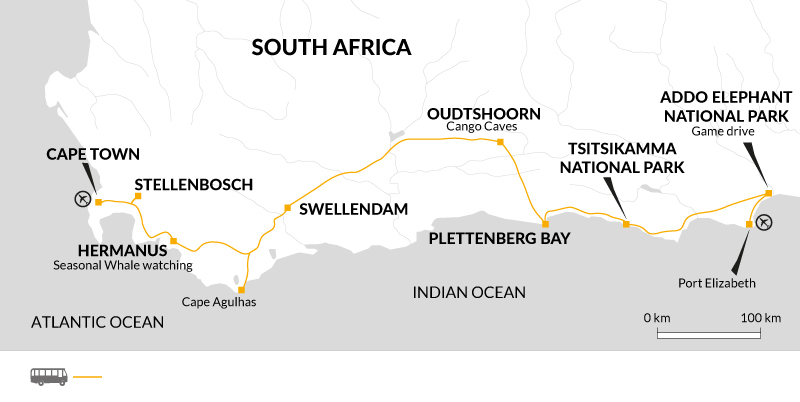 Vibrant Cape Town, African penguin colonies, world-renowned wine-tasting and spotting herds of elephants are some highlights along this route of cities, beaches, desert and forest. Hermanus - Spot the migrating mammals from land in the whale watching capital of the world (in season). Arrive in Cape Town, South Africa's Mother City, flanked by the Atlantic Ocean and Twelve Apostles mountain range. Depending on the flight arrival time, you may choose to enjoy some free time with a bite to eat in the relaxed Kloof Street area alongside Capetonians or explore the Victoria and Alfred Waterfront in the sunshine. This evening, meet your Explore Leader, who will introduce the trip and our plans for the next few days. If you would like to book an excursion to Robben Island, the former prison where Nelson Mandela was incarcerated please use this link: http://www.robben-island.org.za It is very important that you book the 9am ferry for day 3 of the tour. If there are spaces it is possible to book this excursion locally, but this is subject to availability. Take a soft bag, holdall or suitcase. Also take a daypack for items needed during any walks or sightseeing. Take a torch, sunhatunscreen and insect repellent. Binoculars are essential for bird watching. Mosquito nets are not required as the accommodation provides screening where necessary. Although entirely voluntary, tipping is a recognized part of life in this region of the world. Some local staff will look to members of the group for personal recognition of particular services provided. In order to make things easier for you, the Explore Leaders may organise a group's tips kitty and if this is the case, they will account for it throughout the tour. Accordingly, you should allow £20 for tipping. South Africa has a good tourism infrastructure and generally good service standards. Accommodation on this trip ranges from small, family run guesthouses to river camps and national park owned chalets. They are individual in style, set in great locations, often with nice gardens/grounds and have en-suite facilities. The properties we use give a real taste of traditional South African hospitality and we love supporting these smaller local businesses. In Swellendam, we stay away from the town in a quiet and picturesque setting in the bend of the Breede river. The accommodation is simple, rustic, featuring en-suite facilities and well suited for a natural and peaceful experience. Why not extend your holiday and spend four days exploring the 'smoke that thunders', Victoria Falls in Zimbabwe. South Africa's Garden Route is a great introduction to the country, with a fantastic variety of landscape, food, drink and wildlife. You will have the opportunity to climb one of the most iconic natural features in the world, Table Mountain, as well as discovering the countries diverse wildlife; from penguins to elephants.